Xiaomi Redmi Note 5 Pro is the latest mid-range smartphone from Xiaomi which comes with the latest mid-range hardware and MIUI. Xiaomi is shipping the smartphone with MIUI 9.2 based on Android 7.1 Nougat preinstalled with lots of new features which you may know about. We have been using the Xiaomi Redmi Note 5 Pro for the last few days. In this post, we have tried to cover some of the best features and Redmi Note 5 Pro tips and tricks. Let’s get started! Second Space is a feature which basically enables you to create an additional user on your Redmi Note 5 Pro just like on a Windows PC. 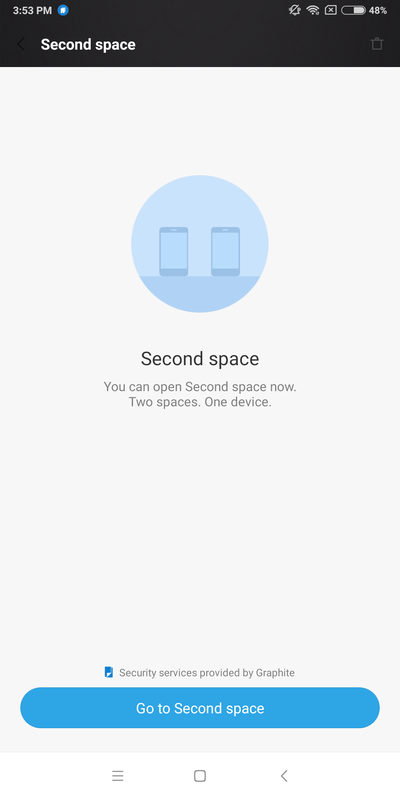 You can create a second space just like a guest account for anyone you don’t want to share your data with. There are more options in the Second Space menu which will let you import or export the smartphone data across the Spaces. Once you create a second space, you will see a notification in the notification shade, tap on the second space notification to switch to second space. To exit the second space, you only need to tap the Second space switch on the home screen. Shortcuts can be useful at times when you want to launch the camera to click a picture, the least you have to do is wake the device up and then launch the camera from the lock screen shortcut. But how about launching the camera without even waking the device? There are many more shortcuts on your Redmi Note 5 Pro which you need to know about, let’s check them all. Camera shortcut: To launch the camera, just press the volume down button twice repeatedly. Enable this feature from Settings > Additional Settings. 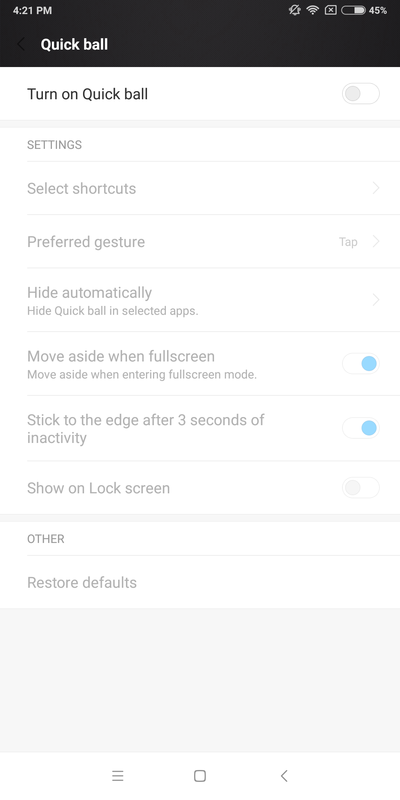 Finger swipe gestures, go to Settings > Additional Settings > Gestures. One of the best things about MIUI is the sheer number of small features that improve the overall user experience. 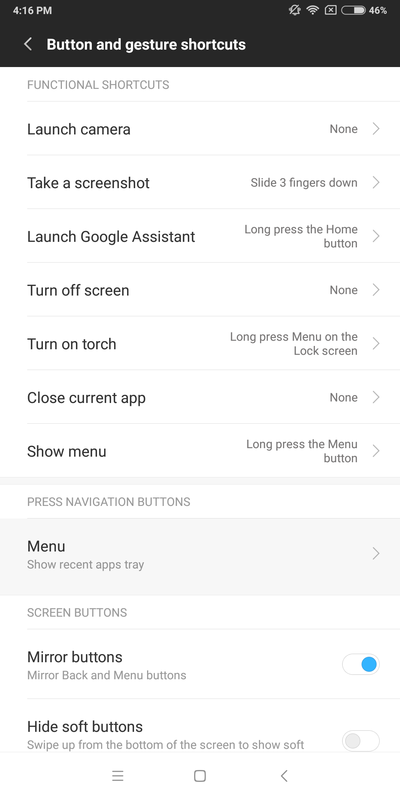 Additionally, Xiaomi generally gives you an option to enable or disable such features, allowing you to customize the user interface to your liking. One of those features is Memory Status – this feature lets you view the amount of free RAM in the recent apps screen. To enable this feature go to Settings > Display. Quickball is a feature which is similar to the iPhone Assistive touch, the Quickball is a floating ball which helps to navigate through the smartphone’s user interface. Enable this feature from Settings > Accessibility > Quickball. Xiaomi Redmi Note 5 Pro comes with a large display and sometimes reaching the top corners of the display can be difficult. 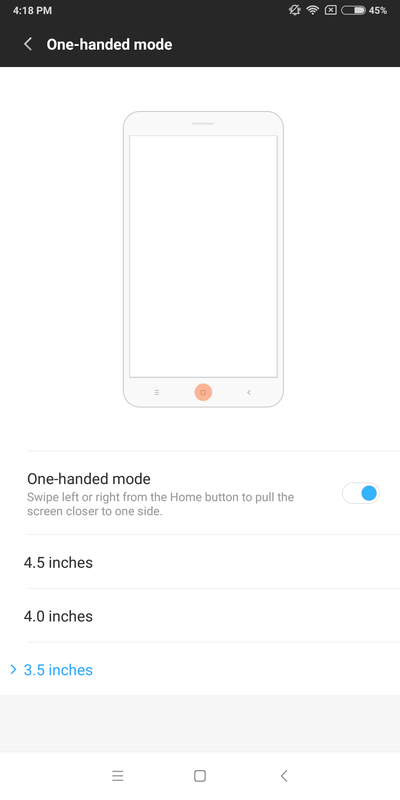 To help with this, Xiaomi has added a One handed mode in MIUI which shrinks down the user interface up to 3.5 inches. You can trigger this feature by swiping left from the Home button on the navigation bar. To exit One Handed mode, tap outside of the user interface. You can enable this feature from Settings > Additional Settings > One Handed mode. Xiaomi Redmi Note 5 Pro comes with the MIUI 9.2 which is not the global ROM, it is still not available on most Xiaomi smartphones. You can master the MIUI 9 came preinstalled on you Redmi Note 5 Pro with these tricks.